Integrating Water Management and Land Use Planning: Uncovering the Missing Link in the Protection of Florida's Water Resources? 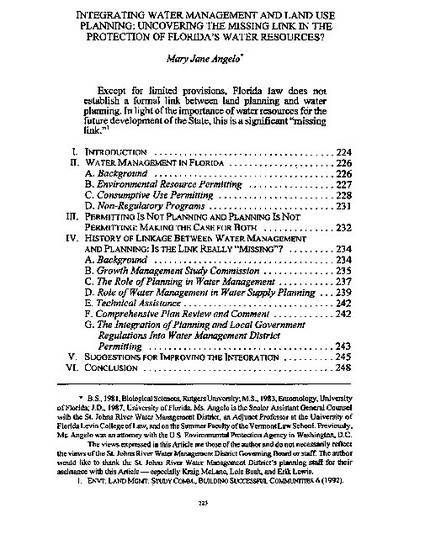 Except for limited provisions, Florida law does not establish a formal link between land planning and water planning. In light of the importance of water resources for the future development of the State, this is a significant "missing link." Land use planners and water managers live in very different worlds and speak very different languages. Water managers point to poor planning as the cause of environmentally inappropriate development, and planners point to the shortcomings of water management regulatory programs as the cause of environmental woes. So what is the problem?Why are water management and planning not better integrated? Should they be? How can we improve this integration?